Lightning allows people to disperse the darkness around the world when it comes to any occasion, event or celebration. Be it personal, religious or commercial, an event is just not complete without lightning. These glowing sources emanate an aura and mood that is simply unparalleled. Our company holds a reputation amongst Tampa holiday lightning service providers of ensuring that every holiday that you choose to celebrate with us becomes a memory that lives on till eternity. Celebrations of events of a grand scale call for holidays around the world. In Tampa, Holiday Lightning Service providers like Tampa Lights take pride in transforming each day into an event to cherish for years to come. It is no new concept for humans to adorn their holiday celebrations with a little bit of lights. For years our ancestors have used candles to lighten up festive occasions and as years progressed, our sources of illumination have evolved considerably. Although candles are still used to symbolize certain traditional and spiritual events, holidays like Christmas and Thanksgiving stay incomplete without an array of lights giving the place an incredible feel. 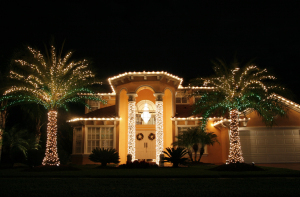 Tampa Lights specializes in any and all holiday lighting installations in Tampa along with the added features of providing impeccable quality in products, services, and customer care. The mark of a service provider that stands out when it comes to holiday lighting installation in Tampa lies in the amount of weight they give to their consumers. Tampa Lights takes pride in providing the most extensive and consumer-driven services in the area. Professional holiday lighting services around the world acknowledge the importance of keeping customer preferences before all else. At Tampa lights, we combine our love for every customer with a wide range of experience from our teams in order to create holiday lightning packages and designs that are truly unparalleled. We provide a number of different types of holiday light decorating services so that every time you step out to have a look at the design and feel of your place, you are bound to feel lost for words. With a variety of spotlights that vary in the amount of light that they generate, Tampa Lights ensures that every holiday and the elements that you chose to decorate your commercial or residential spaces with are highlighted appropriately. Our holiday light designers carefully work with every customer to understand what they would love and then ensure that they are satisfied to the fullest with the holiday lighting installation pricing and services provided. From custom projections to simple up-lighting and holiday landscape lighting, there is a diverse range of settings and outcomes that can be achieved through projection lightning. 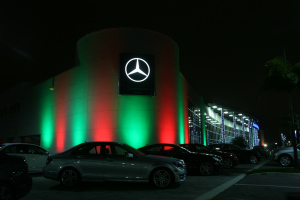 The concept of custom projections to enhance celebrations is gaining popularity around the world because it allows every customer to apply a little personal touch to their holiday lighting installation. Color changing LED spotlights to allow adjustment of the theme throughout the entire duration that the lighting installation is set up in order to give a different ambiance and look every time. Our products allow these colors to be adjusted remotely at any given time to suit customer requirements. Tampa Lights in one of the few holiday lighting companies that understand the type of venue and provide services that are in perfect harmony with the theme of the holiday celebrations. Our holiday lighting installation costs are some of the most competitive in order to minimize the pressure on consumers who don’t wish to go extravagant with their spending. Mini-lights embrace different things around the place including trees, roofs and other props that are used to uplift the overall feel of the place. Tampa Lights is one of the renowned Christmas light installers in Tampa, FL that understand the specifications of every household and provide designs that suit budgets and tastes accordingly. The crux of every celebration and the decorations that are done to celebrate it lie in the level of personalized customizations that are possible. This is because the final results allow the customers to take a sense of pride that they were able to design and achieve the wonderful scene that stands before them. In this regard, Tampa Lights provides it consumers a free hand to go creative with the type of lightning that they require. Our services cover a wide variety of domains and we specialize in keeping consumer preferences at the behest of everything. Backed by the sound professional expertise of our team, we make your holiday celebrations memorable by brightening every little aspect there is. To learn more or get a quote, get in touch with us today.